Ok here we go again, this time I want to review the triple tube bird feeder, the name is Birdscapes Triple Tube 2-in-1 Feeder Perky Pet, now this is a feeder for serious bird feeders. It has nine feeding ports, and triple seed reservoir, its size and versatility makes it worth in any season. This feeder has extra-large capacity with multiple tubes, that can easily give access to 9-10 birds at the same time, triple tube design gives you versatility of seed, and what bird you want to attract. Birdscapes 2 in 1 is build with solid construction, with protective cover and tray to catch seeds and hulls. Easy removable lid makes it easy to clean and refill. The size and weight of the feeder may not be suitable for every bird feeder, it is one of the larger feeders on the market, and its size may be inconvenient to some. Also the plastic tubes can show wear and color loss over time, and plastic lid screw on top that hold it can loosen after time. The feeding ports can easily switch from larger seeds to mix seeds , or small seeds, this is a great feature that gives you more flexibility in different seasons, as birds can change from season to season. Metal ports are coated to be durable, and will last, it is equipped with ventilaton system to keep seed dry, and prevent mold , that can harm the birds. The feeder is made with plastic tray base to catch fallen seed, and drain holes for water in case of rain. This plastic tray can be used by birds to perch on it. 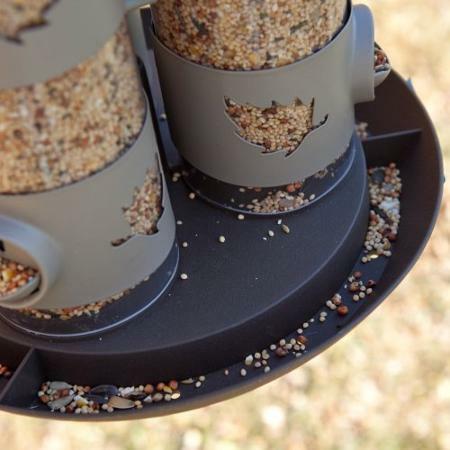 This triple bird feeder is equipped with a squirrel baffle. It is a plastic shaped dome that is installed on the top of the feeder. This plastic dome serves as a protection if a squirrel comes down from the top using a rope or a chain where the feeder is hanged on. Now this will help prevent squirrels from coming down and eating the seed, but it is not %100 success rate. Squirrels are intelligent and will try to find other ways to reach the feeder. One way is to jump from the ground and on the feeder, if the squirrel manages to do that it can damage the feeder by chewing on it. Other way is to try to jump from the sides, maybe by using a branch, or some other object placed close to the feeder like a pole or a fence. To prevent this place a feeder higher from the ground, and away from any such objects. As this feeder is plastic this is a MUST if you want to preserve it from the squirrel teeth. What birds will come to this feeder? This seed will be favored by cardinals, titmice, nuthatches, grosbeaks, finches etc. You will attract lots of birds with sunflower seed , it’s a favorite seed of lots of wild birds. Maybe the most favorite of all seeds. Goldfinches, house and purple finches, and siskins are extremely fond of this type of seed and will select it and come to the bird feeder, this birds eat this seed in preference to most other foods out there. You can fill one tube with whole or crushed peanuts , these are popular with woodpeckers, chickadees, titmice, nuthatches, wrens, kinglets, northern mockingbirds, brown thrashers, starlings, jays, and certain warblers. These birds will happily fly to the feeders that offer peanuts and stick around. This is the cheapest generic mix that is easy to find, but it is not the best choice, as the mix seed are not targeting to a specific type of birds lots of the seed is going to stay uneaten or fall on the ground as the birds dig thru it to get the one they like. This feeder is heavy and must be placed in the right place. I recommend that you place this bird feeder in some place away from the heavy wind. In a storm because it is so heavy the hook that holds a feeder can snap and will fall down to the ground. This will damage the feeder as it is made of plastic. Some of the users have mentioned the plastic threaded top was flimsy and broke easily, however, this can be prevented if you fill the feeder properly. The top of the feeder screws off in a counterclockwise manner, the same as most other multiple tube feeders out there. Make sure you are gentle when doing this and you'll be fine. If you force it this will damage the screw after some time and it will snap. The feeder holds a good amount of seed so this gives extra weight to the feeder and in wind this is what can damage the hook. I recommend you fill the feeder up to one third and not more if you cannot find a place away from high wind. This will make you refill more often but that is preferable than the feeder falling down. If squirrels are allowed to jump on the feeder and spin it around this will unscrew the top and will fall down on the ground, one more reason to place it away from squirrels. The other solution is to mount a feeder on a pole, this will solve the problem, there is a bottom mounting hole for this. This triple feeder is bigger size , and can look scary for novice feeder, but versatility and its capacity is a plus, and will attract serious bird users, the birds are going to love it, just make sure you place it far away from the tree branches so squirrels don’t jump on it. All in all if you want more then one feeder in one design this is a good idea, and will bring you lots of great bird watching. 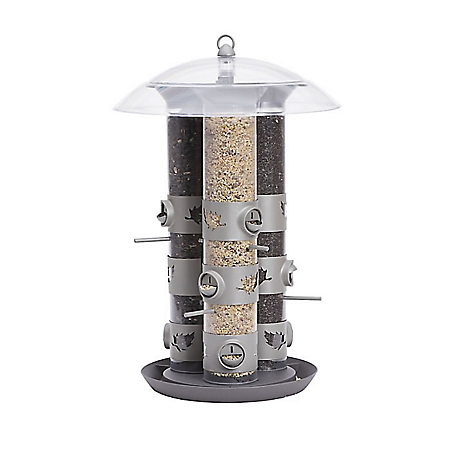 Check Birdscapes 329 Triple Tube 2-in-1 Feeder here.